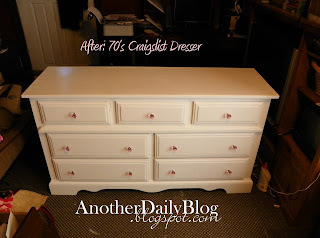 In my previous blog, (click here) I showed you the 1970's Craigslist dresser redo I did for my daughter. I kindly refer to her previous state as "the beast". As you know, the beast had some pretty interesting drawers. 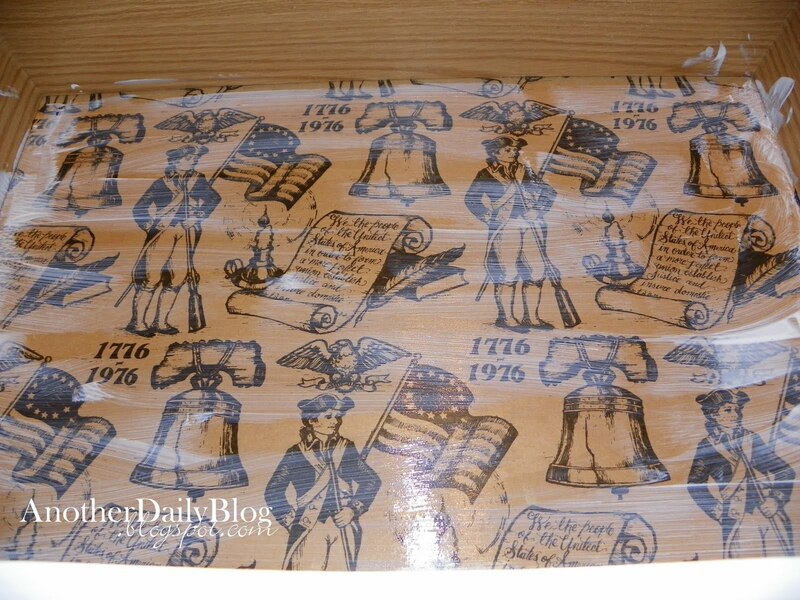 Some sort of Independance theme. Totally cute for the time period the dresser was around - I am sure - but not so fab for a little girl. 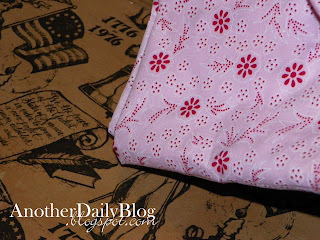 I was going to buy new fabric to decoupage the dresser drawers, but funds became extremely tight, and as cheap as it sounds, I just could NOT afford to splurge on fabric. ((It happens))..
About that time I remembered that nearly 6 years ago, MiMi was a few months old, I was toting her on my hip in a local Wal Mart and they were doing away with their fabric section. I had spotted a pink & red funky fabric, & being only a dollar a yard I had the strong impulse to purchase 3 yards of it. I had no idea what I would do with it, but I liked it enough to buy it. AND hang onto it for 6 years. 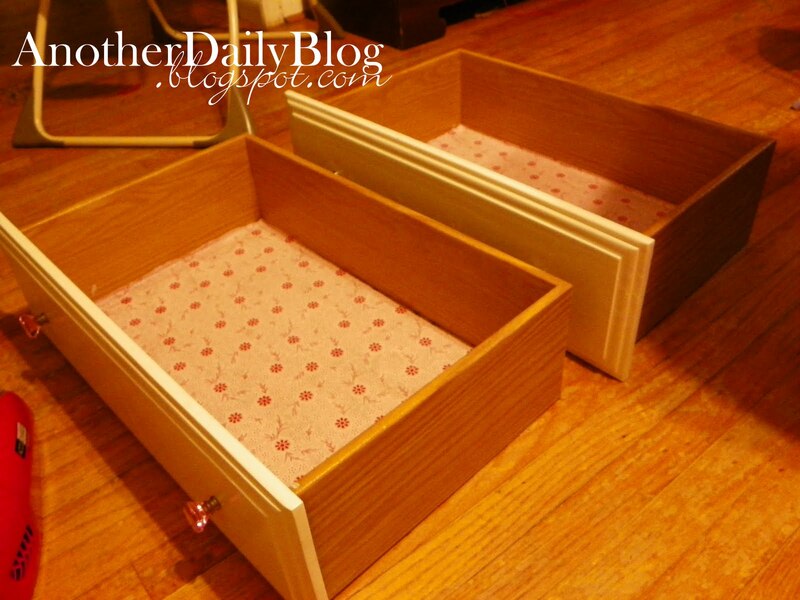 That's when it dawned on me, this would be PERFECT for the dresser drawer liners. 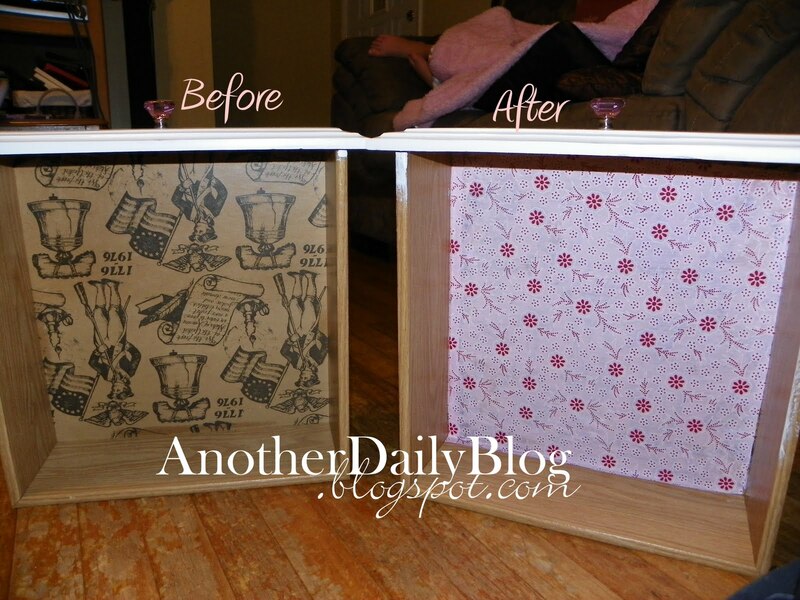 All I would need to do was try and cut it to size, slap on some mod podge and call it a day. Isn't it funny how EVERYTHING seems meant to be. Simple things like this fabric I have held onto for so many years as my 6 year old was a small baby and here I am using it on something for her now. Yes, I am a nerd and have no social life, obviously). cutting, mod podging the drawers and laying the fabric in. Tomorrow I will put the Mod Podge on top once it cures and call it a done deal. I love it so far, and my daughter does as well. 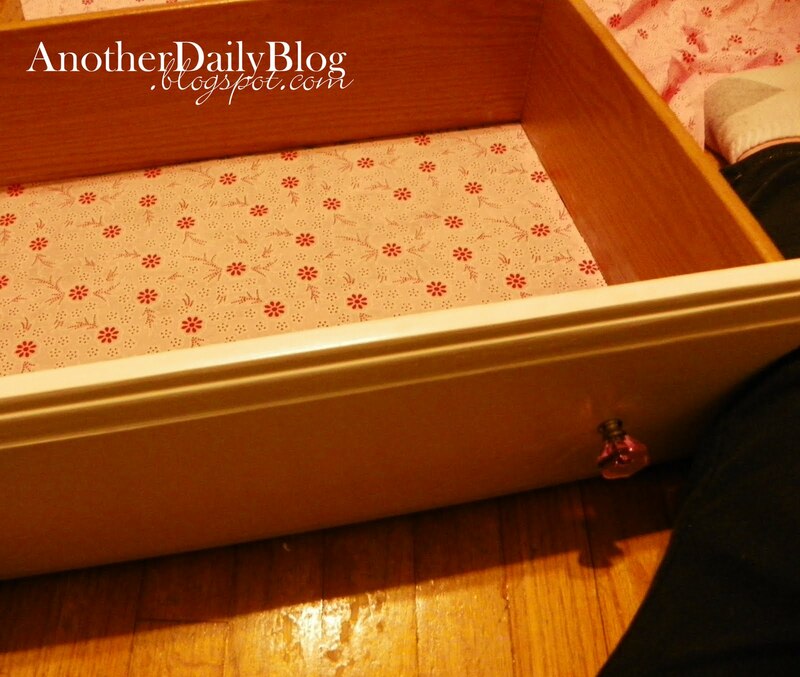 Fabric, meet old drawer design. 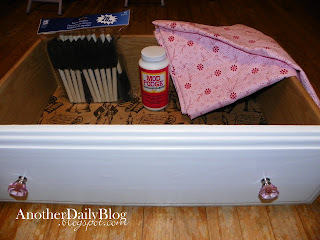 Mod Podge added to drawer. The beast, all I can say is, You've come a long way baby! 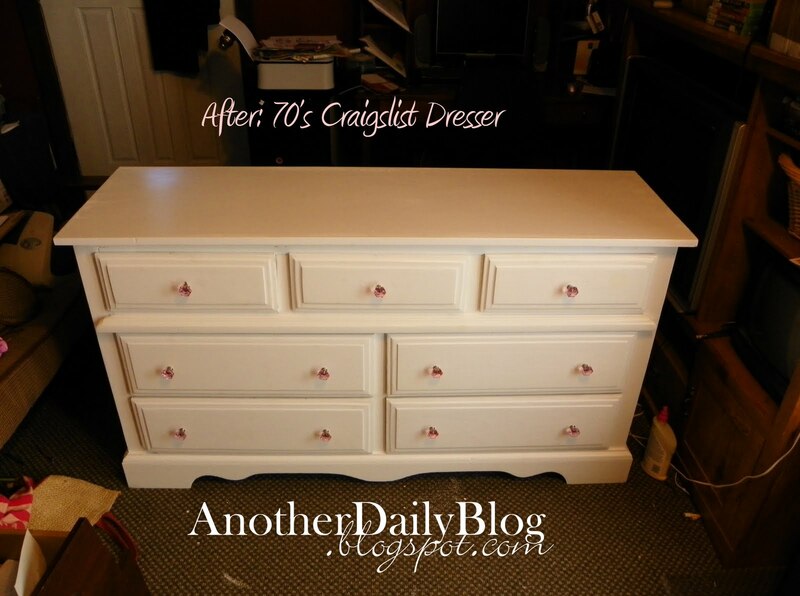 First let me show you the beauty that is the 70's Craigslist Dresser ReVamp! Her previous owner said she was solid wood and in good condition. When we picked her up I laughed. Her only solid wood features were her drawers and fronts. The sides and top were VERY much cardboard veneer. Her top came with a huge gash, plenty of stains, etc. She only cost $35 bucks. When I started to disassemble her the next day to sand down and clean, I nearly wanted to give up on this refurbish. You see, I love a Craigslist re do just as much as the next, but she came with TONS of live spiders, dead roaches and roach casings, and even rodent poo. First we removed the long veneer liners. As much as they could of been cleaned, the fact they harbored roaches and rodent poo was just not going to fly for something that would house my daughter's clothing, so we took those out. Then she sat for a few weeks. Knobs- $14 x 3= $42 (these are much pricier else where). 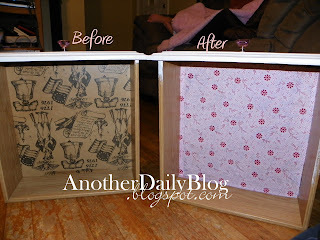 I am going to decoupage in some new drawer liners soon & then it will be totally complete! Figuring you can't touch a dresser this size that is NOW solid wood for under $400 bucks, I say the $107 (including dresser cost) and some elbow grease is well worth the hardwork. Even if she DID come with some NASTY surprises courtesy of the previous owner. I bought a dresser off Craigs List last month. She was a beast. I will share the extreme before and after photos in my next blog. And by extreme - I mean roach casings, spiders, rat poo, the whole sha bang (yes she was a filthy beast). However, I have sanded her, replaced her top, took out the middle sheets that seperated the drawer areas (because they had rodent poo etc I wasn't even going to clean them. That's filthy to me and no telling what diseases it harbors). I have painted her, replaced the knobs and loved her. I am re doing the inner drawer liners next, and then she shall be ready for the big reveal. This is for my daughter's room. Lots of sanding & 4 coats of paint using a medium sized painter's brush, taking my time so the paint doesn't clump, and she looks brand new!! Hopefully I can reveal her this weekend! 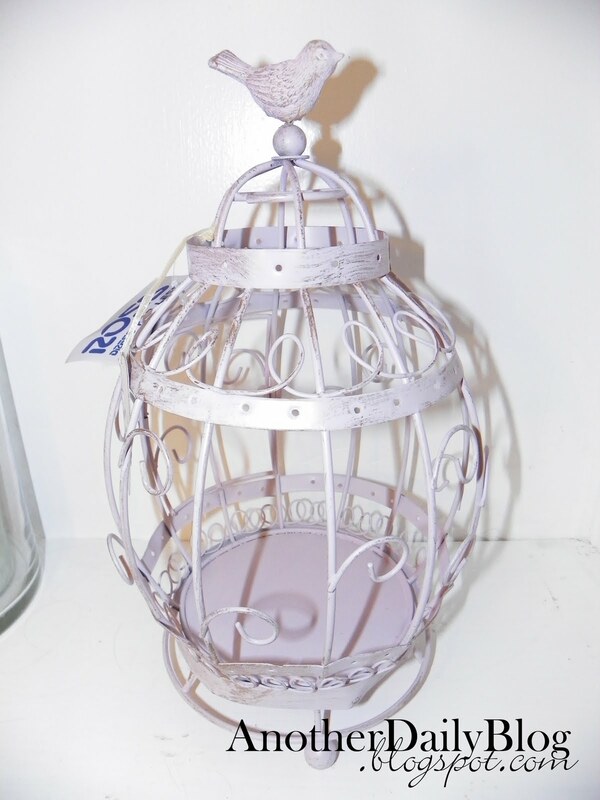 Random Shabby Chic CUTENESS @ Ross!! Sometimes I forget that Ross exists. Matter of fact I only happen to notice it when I am at the neighboring craft store, and of course I'll always stop in and browse and buy things if I need them. Seriously. I am pretty absent minded these days. I figured my little girl was in desperate need of jeans shorts. She seriously has ONE pair of denim shorts. I have no idea what happened to the rest. Some people have a monster in their drying/washing machine that eats socks. Me? I have one that eats shorts. Okay, she was actually holding it and giving it a look over. 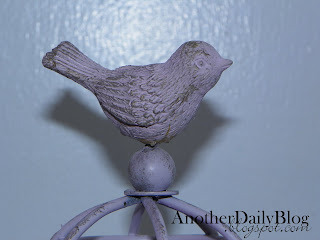 She set it down, and the second she did I snatched it up because I didnt care what it was, I wanted it for MiMi's room. 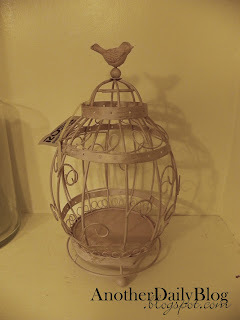 It's a bird cage jewelry holder made of metal. 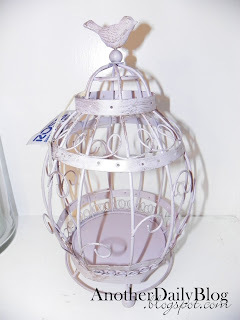 It's painted in shabby pink paint and I LOVE IT! Now hopefully tomorrow I can get the fabric for this craigs list dresser I have refurbished for her and all will be great. I haven't been couponing this week. Nothing too interesting going on for me. We did manage to seel 100 canes of bamboo for $85 though :) This makes me a very happy girl!